The value of effective public engagement and its importance to achieving impact is now widely recognised by researchers, institutions, scientific bodies, and funders. Despite this, many researchers remain unsure as to how to go about it. Anastasia Skamarauskas outlines a five-step process towards effective public engagement; from initial scoping right the way through to eventual dissemination, with the early involvement of a diversity of voices being fundamental to success. Public engagement is now strongly encouraged in the research community; by funders, institutions, and scientific bodies. Many researchers are persuaded of its importance and the impact it can have but are left wondering how to do it. 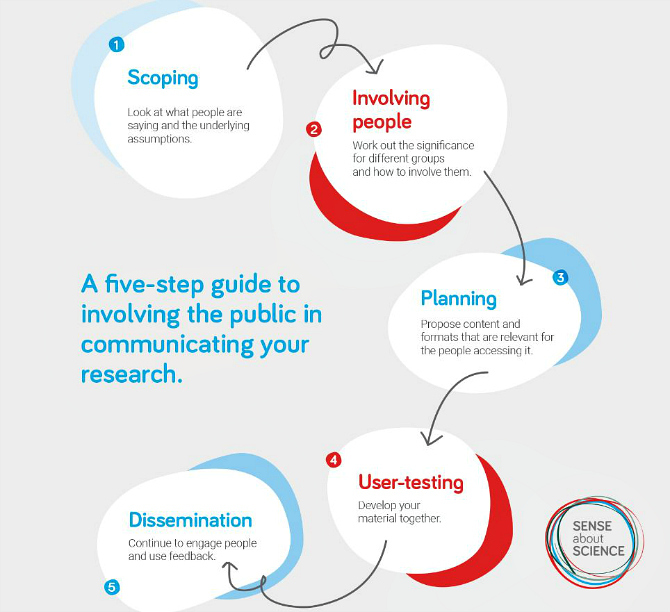 Last week, Sense about Science launched “Public engagement: a practical guide” which sets out a clear message: involve the public; and involve them early. Sense about Science has partnered with researchers for over a decade to engage with the public on difficult and sensitive issues. We are yet to find an issue too complex, polarising, or sensitive to involve the public. In fact, it is often precisely these kinds of issues where involving people throughout your project can have the most notable impact. In 2016 we worked with National Institute for Health Research-funded researchers to communicate children’s heart surgery unit statistics, and the guide uses this project as a case study throughout. The five-step process we have developed can help researchers from a wide range of disciplines discuss and present research information in a way that is shaped from the outset by people who will use it. Scoping – start with where the public discussion is. What is currently being said in news media, public statements, social media, blogs and forums, advertising, and policy? Don’t just look at your specific topic, taking a broader view can create a richer context. Scoping the discussion gives you an idea of where people are starting from with the issue as well as who it is you need to engage to have the most impact. Involving people – this is key. Find the audiences for your research (scoping will have given you a good direction). Work out the significance of your research for different groups, and then think about how to involve them in developing your resource. Public engagement doesn’t need to be about reaching the widest audience possible; “Understanding Children’s Heart Surgery Outcomes” isn’t relevant for a large group of the population but, for parents and patients, being able to understand surgery unit data has a big impact. Be open-minded about who you include; a diversity of voices can give you a more rounded view of how your resource will be received and used. Planning – now you have an idea of your audience and who to involve, what is the best format to communicate your findings to them? And what context and key information is vital? Use the language you’ve come across in the previous steps. Think about the skills you need to develop your resource: an event organiser, software developer, etc. Involving them in the project early on gives them a much better feel for the audience and the key messages. User-testing – this is where you develop the resource from your planning stage. Meeting with the people you involve is by far the best strategy but there are alternatives that are certainly better than not testing at all. Be prepared to go back and forth when consulting your users (“Understanding Children’s Heart Surgery Outcomes” took 18 months to co-create). Doing this means you develop your resources with your intended audiences. You also often develop the way you explain concepts and can anticipate and head off any misinterpretations that come up at this stage. Dissemination – this is the last stage but you should not leave it to the last minute to think about it! You’ve already considered your target audience and will have involved some of them throughout the project. Keeping them updated gives them a sense of ownership over the project and is a great thing when it comes to them sharing it with their networks and contacts. Think about whether the resource is newsworthy (not everything is) or if an event would spark the interest of your audience. A graphic, animation, or image might be most effective for sharing on social media. It’s important that your project team plans to remain involved and active for this stage however tempting it is to jump into the next project. We want the public to be able to make sense of the research they come across and be included in the development of how it is communicated. Our guide gives researchers the practical tips and tools they need to do it. Sense about Science is an independent charity that challenges misrepresentation of science and evidence in public life. We advocate openness and honesty about research, and ensure the public interest in sound science and evidence is recognised in public debates and policymaking. “Public engagement: a practical guide” is available for download from the Sense about Science website. Featured image credit: Railway station from above by Timon Studler, via Unsplash (licensed under a CC0 1.0 license). Anastasia Skamarauskas is the communications officer at Sense about Science, coordinating its social media message and sharing its work with the public. She also supports the Voice of Young Science (VoYS) programme, a unique and growing network of over 2,000 early-career researchers who are committed to playing an active role in public discussions about science. Prior to joining the team in 2016, Ana graduated from the University of Bristol with a BSc in zoology. She went on to work for the university’s centre for public engagement. After a passion for sports engagement was ignited when teaching gliding to cadets, Ana coached in Fijian schools as part of a programme to improve participation.